31st August 2012 is the Independence date of Peninsula Malaysia then known as Malaya in 1957. But in the EPL, every 31st August in the last few seasons, transfer activity is in a frenzy. Everton brought in 2 new players on the deadline day. Brian Oviedo arrived from Denmark. The Costa RIcan International is a left sided player and can play in defence and midfield. Another young player joined us, Matthew Kennedy; from Scottish side Kilmarnock. The Young midfielder is highly rated and will boost our junior team. He may be one for the future. We also signed a 3rd player, Belgium's Vadis Odjidja-Ofoe from Club Brugge but the transfer was disallowed by FIFA on the basis that the transfer papers was submitted a few minutes later than the deadline timeline. We may see him in January 2013's transfer window. 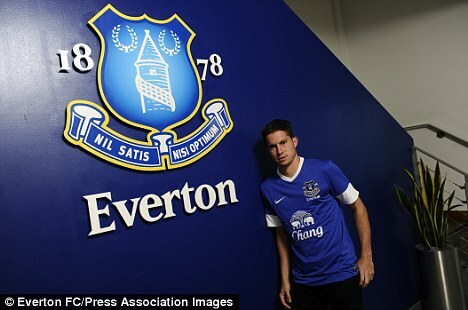 All in all, it was a fruitful transfer window for Everton. There are rumours that Moyes may want to sign up a few more free-transfer players. Names which are being mentioned are Owen Hargreaves and Thomas Hitzlsperger. We will wait and see the development on that, in the next few weeks. I don't like his workrate. Passing a bit wayward. Maybe he can see the folly of his ways and emerge better as has Anichebe!